SIR, Apropos your lead story, “Five jawans killed in Pak attack” (7 August), those who consistently bat for peace negotiations are living in a fool&’s paradise. This year, Pakistan has violated the peace pact 57 times. How long will India remain a mute witness to this brutality? The army is the most powerful entity in Pakistan and its attitude towards India reaffirms that the “peace process”, so-called, is a hoax. 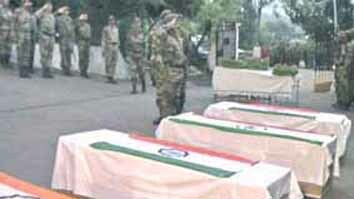 India never retaliated when Parliament was attacked; nor even when our soldiers were beheaded. It appears that we have submitted meekly to the terror unleashed by Pakistan. China and Pakistan have adopted a joint strategy to destabilize India. Amidst this gloomy scenario, the much-orchestrated “peace process” seems to be meaningless. The Most Favoured Nation (MFN) status accorded to India by Pakistan should be rejected. If Pakistan remains belligerent, India should consider severance of diplomatic ties, if not a limited operation along the LOC. There can be no simulated friendship at the political level in parallel with offensives on the ground. Contextualised with the intrusions into Ladakh, both Pakistan and China are taking India for a ride. Yours, etc., Aranya Sanyal, Siliguri, 7 August. SIR, This refers to Usha Ramanathan’s letter on the UID project (8 August). She is one of the very few researchers who has extensively studied and written about the UID project. This series being carried by The Statesman represents possibly the most exhaustive account of the technological, social and privacy implications. For a project of this size to have been hardly commented upon by anyone in positions of power or influence, raises extremely troubling and vexing questions. The large-scale roll-out of services based on this platform without any sort of clarity across multiple issues is a very risky proposition and can be hugely disruptive. The country can ill-afford to ‘experiment’ on its people on the scale proposed by the project without potentially severe consequences. It is best that we pause and complete a series of pilot projects (currently under way with very unclear results in several districts) that establish beyond all doubt the superiority of a centrally data-based, biometric system that is all encompassing over local systems that are much cheaper and likely to be sensitive to local conditions. We will also need to enact a privacy law that comprehensively addresses real fears about data security and breaches of individual privacy. This is the minimum requirement before a large-scale roll-out of this project. SIR, The Food Security Bill is disoriented; it puts the cart before the horse. It will lead to runaway inflation and the investments of the salaried class will lose their security-value, as had happened in Australia in the Eighties. This Bill is an extended application of the same disingenuous, incoherent, greedy and skewed thinking that produced the 2G and the coal-block allocation scams. It might lead to street violence, even resulting in death. Right-thinking politicians, if there are any, can yet turn the tide.